Storage is always going to be at a premium in an apartment bathroom, and if you have a particularly stringent rental agreement, you won't be able to alter the look of your walls to keep your toiletries and bathroom accessories out of view. Luckily, according to DeccanHerald.com, there are some compact items that can dramatically improve your storage space and traffic flow. Easy-to-stack storage containers are wonderful options to keep everything in your bathroom organized, but try to utilize them near a bare wall to make use of every possible available space. Go for a set of translucent containers, so you'll never lose track of any of your toiletries. Floating wall shelves are another popular style choice in bathrooms, and you can find them in any color and finish. These can be arranged on a wall into a special design, or throw a few on the wall side-by-side to display family photos, decorative accents and anything else that adheres to your color scheme. Even in the smallest washroom, you can utilize these items to improve the flow and storage capacity of your bathroom. 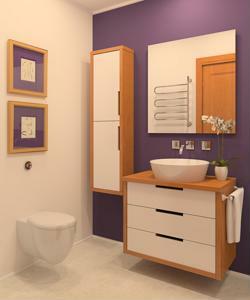 What storage options do you prefer in a cramped bathroom?